We are sorry to hear that your order is damaged! We are happy to assist you with any issues, but first our customer service team are obliged to receive a picture from you in order to proceed with a reorder for a replacement item. Please select the correct damaged part of your necklace so that we can treat your specific problem. 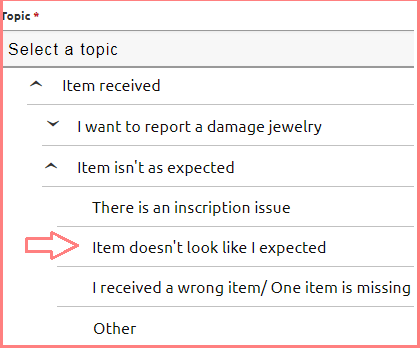 It is required to send a picture of the damaged item for us to determine how to proceed. We'll get back to you as soon as we can to offer a replacement item according to our warranty policy. Please note to check your email to see if you've received a response from us within a few hours. Your replacement item will be shipped within the time frame for the standard shipping method, that will be active on site at the time you contact us. We want to assist you and send out a new chain to you! 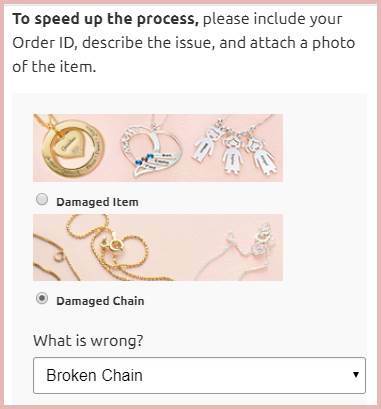 It is required to send a picture of the damaged chain for us to determine how to proceed. We'll get back to you as soon as we can, and depending on whether you have warranty,we will offer a replacement chain which can be easily reattached with a pair of pliers, or by your local jeweler. Your replacement chain will be shipped within the time frame for the standard shipping method, that will be active on site at the time you contact us. At MNN we strive to provide unique, high quality jewellery that you can proudly wear to celebrate your loved ones and cherish your most precious moments. If you are unsatisfied with the product you have chosen or it has arrived damaged, please let us know immediately. Our team will help you either refund the item or offer an exchange. To contact our Customer Service Team in regards to a refund or replacement, please fill in the following form. If the chain length you received is different to the one you ordered, we’ll gladly send you a new chain which you can easily replace by yourself with a set of pliers. If you ordered the wrong chain length and would prefer a new chain, please contact our Customer Service Team and we’ll gladly ship a new chain to you, at no extra charge. If your chain is solid gold please consult our Customer Service Team for further instructions. I Received An Incorrect Ring Size, What Should I Do? If you find that you ordered the wrong ring size, we’ll gladly resize it once to any size at no extra charge! Please consult our ring size guide to determine your correct size, then contact our Customer Service Team to coordinate sending your ring back for adjustments. I Received an Incorrect Item in My Order, What Should I Do? If you receive a wrong item in your order, please let us know as soon as possible so that we can sort it out straight away. Start by checking your order details to ensure that the order was placed correctly with the personalization that you chose. Then contact our Customer Service Team with your order number and a photo of the incorrect item. We’ll send you a replacement as quickly as we can. I'm Missing an Item from My Order, What Should I Do? We're sorry to hear that an item is missing! We ask that you please check your Order Confirmation to make sure that the details are correct and as you ordered. We may have sent your items in separate parcels so please check your emails to see if any of your items will be arriving separately. If your order has been sent in different parcels, each delivery note will tell you the items you can expect to find inside. Please check the delivery notes from each part of your order to make sure you're not missing anything. 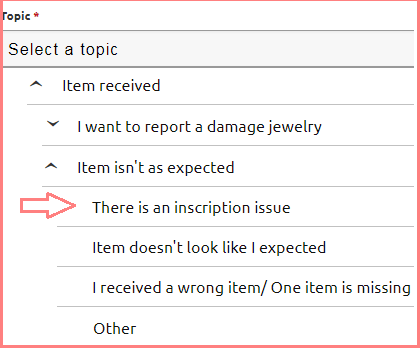 If an item is missing, please contact our Customer Service Team with your order number, the name of the missing item, and a link to the item webpage if you have it. We will resolve this issue for you as quickly as we can. We are sorry to hear that your order is not to your taste. We are happy to offer you to exchange the item for another, but first our customer service team request to receive a picture from you in order to make sure the item matches our quality standards, and that the details are as described on site. If the mistake is ours, we are happy to rectify our mistake and to offer a free replacement item for you with the correct inscription.